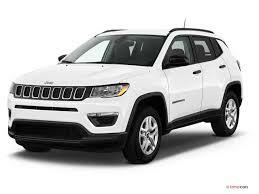 The inter iors of the Jeep Compass aren’t very swanky and lavish. The dashboard is simple yet functional having a dual tone treatment. You’ve got a chunky three-spoke steering wheel with audio controls but there are some dummy buttons for the cruise control, which is not being offered in India. The instrument cluster looks premium having a huge MID in the middle and is easy to read. There is a neatly integrated touchscreen infotainment system. The user interface looks good but the touch quality is just average. Jeep offers Apple CarPlay and Android Auto for smartphone connectivity. The sound quality of the audio system is rich and quite satisfying. Some of the features missing in the Compass are sunroof, electrically adjustable seats, auto headlamps, auto wipers, etc.